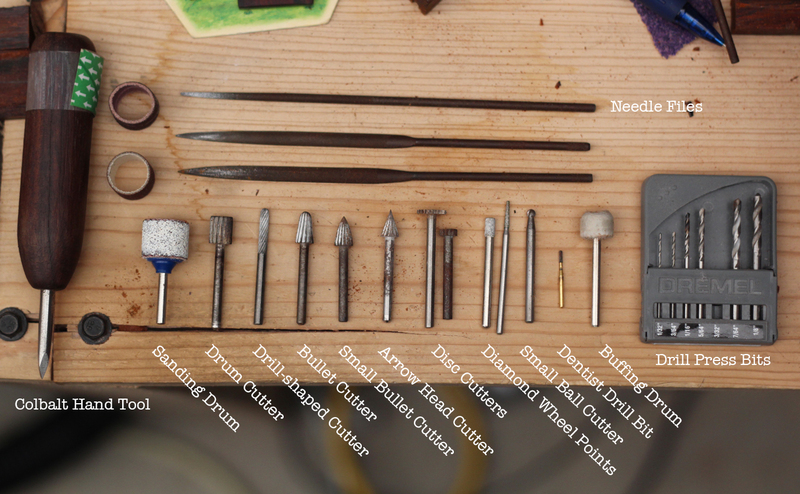 Various Tools/Bits used for bone carving. These are at least the pieces I have found most useful over time. Most of the cutters do the same thing but can be used in different situations when you need the right angle or size to fit. I used to use metal cutters rough out my my work but eventually found that the sanding drum does the same thing in half the time and doesn’t leave little chips out of the bone. The dentist drill bit is great for drilling small holes and also has a cutting edge so it can be used for fine detail carving. It is one of my favourite tool-bits for carving and dentist will usually give them to you for free (used). Course and fine needle files will come in handy and help with the odd angles when in the sanding phase. The Colbalt steel hand tool is essential for detail and complicated pieces. I invested in a Dremel Drill press for drilling the holes as it helps keep things aligned and allows you to drill slowly though thin pieces without putting too much pressure on the bone.